It smells delicious, looks pretty, and makes all kinds of wonderful claims on the packaging, so I bought it. Oh, when will I learn? This is the limited edition version of the fast-becoming-a-cult product By Terry Baume de Rose, which, according to Space NK (yes, them again) is a “Rejuvenating, reparative, strengthening, nourishing and anti-ageing” wonder product that works on lips, cuticles and, well, practically anywhere else you want to put it. So, a bit like 8 Hour Cream then, only without that gross “liniment” smell that can sometimes be so off-putting. I got some SpaceNK vouchers just before Christmas, and I splurged on a pot. This costs £45! Now, I’m no stranger to expensive lip balms (my Holy Grail lipbalm remains Sisley Nutritiv, and that’s £33 a pop! ), but this shocked even me. I guess it’s because that lovely sparkly effect you can see in the second picture there is made by lots of flakes of pure 24k rose gold. But … even so. And actually, it’s those rose-gold flakes that make this product a bit of a duffer, if you ask me. Now, the thing I like about pot-balms (as opposed to sticks) is that they tend to be more versatile, meaning you can use them in places you wouldn’t dream of putting more traditional balms. I use 8hr cream (and my Badger Balms) like some people use Vaseline. I stick it on scrapes, cuts, burns, zits, cuticles, in my hair, around my eyes, and on the odd occasion, I’ve even been known to use it as a lip product. But this stuff is GLITTERY. 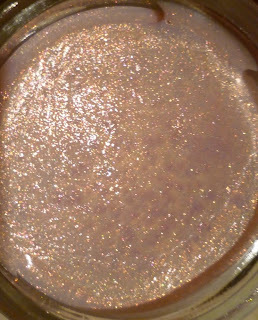 Really, very GLITTERY. And that glitter gets EVERYWHERE. And it’s scratchy glitter too. Urgh. Don’t get me wrong, as a lip product it’s … well, it’s okay. It’s not as moisturising as some other balms (Sisley, Badger Balm, and 8 Hour Cream all knock it into a cocked hat for that), but it’s not a dreadful one either. It is better than many Nivea or Blistex products, for example. But my problem is that damn glitter! You can’t use the balm on your cuticles unless you want to shed glitter onto any porous material you come into contact throughout the day, and you can’t put it anywhere on your face – except your lips – unless you want to look like you like you let a 3yr old with ADHD and a Barbie obsession put on your makeup. Apparently, the balm (sorry, baume) is meant to give you a sheeny glow, but glitter is not glow, and I wish cosmetic firms would stop mistaking the two. It’s a shame really, as I own a couple of By Terry products, mainly eyeshadows, and they’re very good. It does, however, make an excellent base for lipstick, but at £45 a pop, I won’t be re-purchasing. Ever. Previous Post Saturday Link Love! oh you have hit the nail on the head…glitter does not mean radiance, glow or irridescence. Glitter means you sparkle…probably too much. I wondered about/was tempted by the original version of this, which is £30 (so that's £15 they charge to bung in a bit of sparkle.) When I tested this one on my hand in SpaceNK I did not like the sparkly bits at all. I think the original version would be okay – still not worth the price though, if the formulation is the same as this one. I also swatched in-store, but thought the glitter would blend in when applied properly so you just had a rose-gold sheen. I was very, very wrong. Oh, that's too bad. But, I want to thank you for doing the swatches of the Lipstick Queen mini lipglosses – today I received the mini Berries and they all are gorgeous! Love reading your blog. Btw. for a great lip balm I recommend the Dermalogica Age smart lipbalm (Oh, I apologise, it's a "lip complex", whatever). I'm generally not a huge Dermalogica fan, but that lip balm is my favourite. The problem with By Terry is that things smell so nice I get so distracted and end up buying them then cringing at the till when they tell me the total! By Terry does interest me, but £45 is just a complete 🙁 I'd probably be too afraid to use it or take it anywhere. It looks great though! Thank you so much for the photos and awesome review. I ordered this from SpaceNK online (US store) and I was disappointed when the rep told me they were actually sold out and their online inventory was wrong. I tried to console myself by saying it was a good thing b/c spending $70 USD on a lipbalm is INSANE. Your photos/review made me feel so much better. Thanks for the honest feedback. You saved me money from trying to track it down! Oh lord, £45 for a lip balm, where will it end!!! i had a similar experience with the by terry rose de rose blush. thanks for the blog follow and for saving me £45 as i probably would have been drawn in!